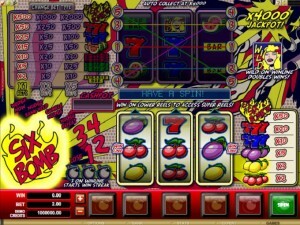 Six Bomb might be one of the classic slots in Microgaming’s arsenal, but it’s far from a simple title to play. It has more features than your average game with 3 reels and it has more things going on at the same time on the screen, while the theme inspiration seems to remain the same classic titles. Microgaming has a number of such games, classics which look out of place in the world of old style 3 reel games. Even as special as this classic slot is, you still get 3 reels and 1 line at its basis. Top payouts can go up to $40,000 though, with symbols being a mix of win streaks, nudges and wilds with multipliers. Among the features which Six Bomb comes with you will discover things like wilds with multipliers and Win Streak features which give you access to things like nudges and other bonus games. The Blonde Girl is the game’s wild feature. What this means is that whenever this symbol appears on the game’s only win line, you get a better chance to form a combo. One wild, plus two matching regular icons, will create a combo which pays twice as much as the paytable would give you for three regular icons of that type. You can also do the same thing with two wilds and one regular icon, the multiplier also being 2x in this case. Even the top jackpot of the game can be worth twice as much this way. The Win Streak feature is also important in this game. It needs three Bomb symbols to trigger it and it gives you access to the top half of the screen, where the 3 reels have 5 lines instead of 1. The prizes are also bigger, with up to 2,000x being won with the right combo, or even 4,000x if a wild’s multiplier gets involved. The betting system keeps thing very simple, using a single coin and allowing you to wager anywhere between $0.10 and $10 per spin with its help. The top payouts reach a maximum value of 4,000 coins, as long as you get into the Win Streak mode. That means up to $40,000. Now, I wouldn’t call the game’s design impressive, but it does have something different to offer you than most of the other 3 reel games. A lot more things are going on at the same time on the screen, so it doesn’t have the clean look that other slots give you. Instead, you will find a comic book like quality to some of the symbols and parts of the design, with the classic influence also being visible. Symbols: Blonde Girl (wild), Six Bomb Logo (50 coins), Red 7 (20 coins), Blue 7 (10 coins), Plum (5 coins), Lemon (3 coins) and Cherries (2 coins). Win Streak Symbols: Six Bomb (2,000 coins), Red 7 (500 coins), Blue 7 (100 coins), Watermelon (50 coins), Three Red Bar (30 coins), Two Green Bar (25 coins) and One Yellow Bar (10 coins). It’s an unusual experience for a classic title, so it’s a game you should give a chance, especially if you’re tired of the same old 3 reel slot machines and you want some excitement. 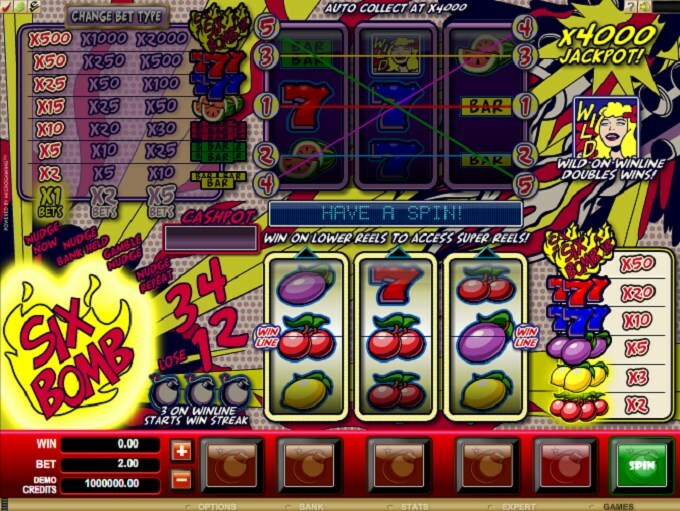 The Six Bomb slot machine is offered through the Microgaming platform, so if you want to play it for real or just to practice, look out for casinos that use it.